These days international borders are becoming less and less of a hurdle to conducting business. Particularly in industrialised countries, the law recognises that business accelerators such as electronic signatures are essential to remaining competitive in the global economy. 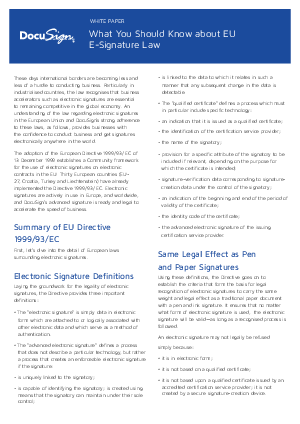 An understanding of the law regarding electronic signatures in the European Union and DocuSign’s strong adherence to these laws, as follows, provides businesses with the confidence to conduct business and get signatures electronically anywhere in the world. Download this whitepaper now to help you understand the EU E-Signature law and the implications of it on your business.